刁俊玲, 刘灵俪, 杜鹃, 李佳渝, 李继斌, 肖晓秋. 新型PPARγ激动剂CMHX008对高脂饮食诱发的糖尿病肾病的改善作用[J]. 中国药理学通报, 2018, 34(8): 1114-1119. DIAO Jun-ling, LIU Ling-li, DU Juan, LI Jia-yu, LI Ji-bin, XIAO Xiao-qiu. CMHX008, a novel PPARγ partial agonist, improves renal function in HFD-induced obese mice with diabetic nephropathy[J]. Chinese Pharmacological Bulletin, 2018, 34(8): 1114-1119. Abstract: Aim To investigate the effect of CMHX008, a novel PPARγ partial agonist, on renal function of diabetic nephropathy in high-fat diet (HFD) fed mice in comparison with traditional insulin sensitizer rosiglitazone. 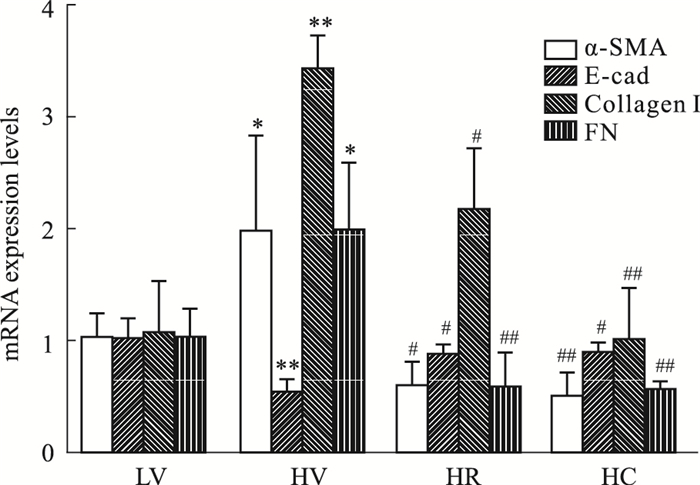 Methods Male C57BL/6 mice fed with HFD were randomly divided into vehicle group (HV), rosiglitazone group (HR) and CMHX008 group (HC), with vehicle treated low fat diet mice (LV) as a control. The urine and serum samples were collected to detect related indicators by automatic biochemical analyzer; Hematoxylin-eosin (HE) staining was used to reveal the histomorphology of kidney; the renal collagen accumulation was assayed by Sirius red and Masson's trichrome staining; the mRNA levels of α-smooth muscle actin (α-SMA), E-cadherin (E-cad), collagen Ⅰ and fibronectin in kidney were assessed by quantitative real time RT-PCR. Results HR group and HC group showed a decrease of urinary protein/ creatinine ratio (Upro/Cr), serum creatinine levels (Scr) and blood urea nitrogen (BUN)in serum treated with CMHX008 were significantly decreased; HE staining revealed rosiglitazone and CMHX008 could obviously improve HFD induced tubular injury; Sirius red and Masson's trichrome staining revealed less accumulation of collagen Ⅰn HR and HC group than in HV group. 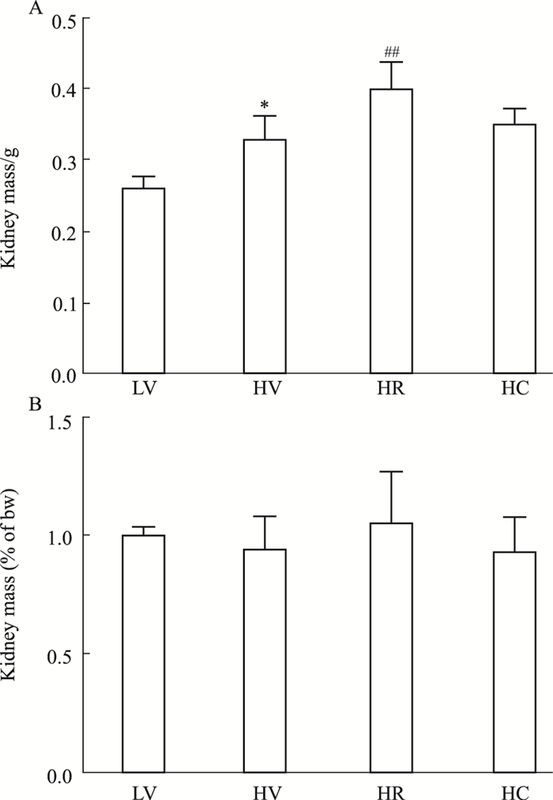 Compared with HV group, kidney mRNA levels of HR group and HC group showed down-regulated expression of α-SMA, collagen Ⅰ, and fibronectin, and up-regulated expression of E-cadherin. 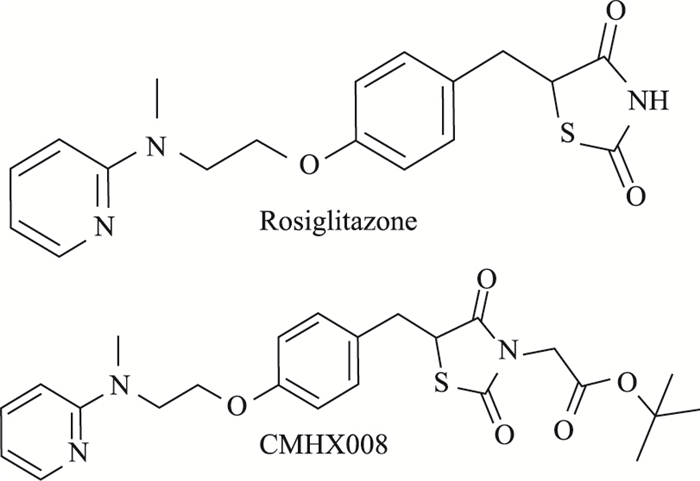 Conclusions Treatment of rosiglitazone and CMHX008 can effectively attenuate renal fibrosis and improve renal function in HFD-induced diabetic nephropathy mice. 杨永玉, 胡长平. 肥胖与脂肪组织重构[J]. 中国药理学通报, 2016, 32(1): 9-13. Yang Y Y, Hu C P. Obesity and adipose tissue remodeling[J]. Chin Pharmacol Bull, 2016, 32(1): 9-13. Wang X X, Wang D, Luo Y, et al. FXR/TGR5 dual agonist prevents progression of nephropathy in diabetes and obesity[J]. J Am Soc Nephrol, 2018, 29(1): 118-37. Zhao M, Chen Y, Ding G, et al. 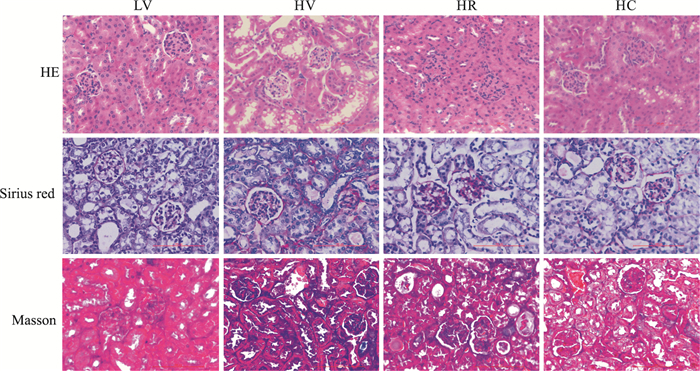 Renal tubular epithelium-targeted peroxisome proliferator-activated receptor-γ maintains the epithelial phenotype and antagonizes renal fibrogenesis[J]. Oncotarget, 2016, 7(40): 64690-701. Ahmadian M, Suh J M, Hah N, et al. PPARγ signaling and metabolism: the good, the bad and the future[J]. Nat Med, 2013, 19(5): 557-66. Thomas M C, Brownlee M, Susztak K, et al. Diabetic kidney disease[J]. Nat Rev Dis Primers, 2015, 1: 15018. Chinese Pharmacological Bulletin, 2018, 34(8): 1114-1119.